Thanks for visiting. Take a listen and enjoy the music! on the email list. Check out my Facebook Music page. To thank you there's a Free Music Download below. Look forward to seeing you at an upcoming show! delivery or maybe their songs or for their guitar playing. with depth and clarity, one gorgeous song at a time." "Great voice, great songs. In The Balance~It's a beauty!" It's pleasure to support your excellent music!" Billy Coulter, Bill Williams, Lynn w/Dave Abe feature and Suzanne Brindamour, opening. Ruthie Logsdon-Ruthie and the Wranglers~ "Some artists are known for their voice or their delivery or maybe their songs or for their guitar playing. Lynn is not just "some artist" She delivers ALL of these with depth and clarity, one gorgeous song at a time." Ron Goad, Songwriter's Association of Washington Board of Directors~ "The warmest voice since Christine McVie." Bob Gramann, Fredricksburg (VA) Songwriter's Showcase~ "There is no other way to say this: Your songs were just plain beautiful. Your songs, voice, and guitar arrangements fit together in a beautiful whole." Hollyfield's "indie-folk-pop style which could have (her) opening up for 10,000 Maniacs or Cowboy Junkies." (Leicasterbangs, UK). Lynn Veronneau, Veronneau, Jazz Vocalist "I've been listening to your CD. It's beautiful...I could listen to your voice all day. A most gorgeous tone." I continue to work on the craft of songwriting. In 2018, 3 Songs are semi-finalist in the Bernard Ebb Songwriting Contest. Finalist in the Mid-Atlantic Songwriting Contest: Finalist in the JAZZ/BLUES VOCAL Category for a new song: "Warm Me from the Winter Wind." (2017) Layers was a semi-finalist in the UK Songwriting Contest-winners announced in Fall of 2016. I was honored to be a part of a Theater Project: The Goddess Diaries. Two of my songs, Shadow and Inside Out, were a part of the ensemble that includes women's monologues, dance and music! The show was performed at George Mason University, JC Cinema, 11/4/16 and benefited the Womens and Gender Studies at the University. I'm looking for more opportunities like this! Honorable Mention in Mid-Atlantic Songwriting Contest-Children's category for "The Tree, The Ship and Me," in 2016. Lynn listed in the TOP Artists-Radio Crystal Blue Podcast for 2016. "Layers" placed as a semi-finalist in the UK Songwriting Contest 2016: FOLK Category. Lynn Hollyfield-placed in the TOP 100 RadioCrystalBlue for 2015, DJ-Dan Herman. In the Fall of 2015 I took an 8 Week Songwriting Class with Cathy Fink (Grammy Award winning songwriter and all around Music Wiz). Learned alot!!! UK SONGWRITING CONTEST-Semi-Finalist for 3 songs: Life and its Beauty, Because of You and Winter's Gift-winners will be announced in November, 2015. Opened for Tret Fure at the Carroll Cafe-March 2016. www.tretfure.com. I will be doing a FOCUS concert with Bill Staines, in June, at the Masonic Temple, Alexandria,VA. In March 2015~ it was quite a month. In March 2015, I performed at the Washington Area Music Awards Cerermony and also showcased as the SS Cape May-Singer-Songwriter Conference, Cape May, NJ. Carol Burbank, collabateur in songwriting, attended with me. GREAT NEWS! Lynn received 5 WAMMIE Nominations for the new CD In The Balance: Best Contemporary Folk Album, Best Contemporary Folk Vocalist, Best CD Design-Noah Urban / Mazuzu.com, Lynn-Artist of the Year and Songwriter of the Year! Mid-Atlantic Songwriting Contest Winner: 4 honorable metions for Because of You (FOLK), Fear the Wind (Adult Contemporary), Winter's Gift (FOLK) and Life and its Beauty (Vocal Blues and Jazz) Also-Lynn was a semi-finalist in the 1st Annual Bernard Ebb Songwriting Contest, Bethesda, MD; In The Balance listed in the TOP ALBUMS for 2014-Folk DJ Listserv. Opened for Christine Lavin, Cellar Stage, Uptown Concert Series, Focus Music 4/2013! 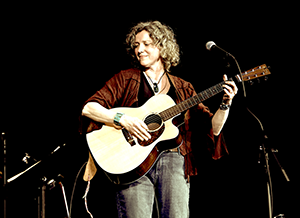 On 11/13/12, Lynn opened for Loudon Wainwright III at the Ram's Head Inn, Annapolis, MD. PaulMerklein.com - Loudon and Lynn show review. Blog commentary from the LW3 show, 12/13/2012, where Lynn was the opening act For Loudon Wainwright III at The Ram's Head Inn, Annapolis, MD. "Posted on December 14, 2012 "On December 13, I saw my favorite songwriter Loudon Wainwright III perform at the Ram’s Head Tavern in Annapolis, Maryland. I’ve seen Loudon before, and his set at the Ram’s Head was more downbeat than usual, without being a downer. He opened with a song about his father called “Surviving Twin”, and played at least 6 songs from his new cd “Older Than My Old Man Now”. Loudon’s opener was a talented local songwriter named Lynn Hollyfield, who performed a brief set that was so good, I wish she would have played a few more songs. Lynn’s website is Lynnhollyfield.com." Thank you Paul! KICKSTARTER CAMPAIGN Fully FUNDED-$10,800 pledged to the new recording!!!! CLICK HERE to check out updates on the new recording-In the Balance! Carey Creed's new CD project, Small Braveries, received the Best Contemporary Folk Album Wammie; Thank you Carey for asking me to be a part of the backing harmonies on this great album. www.CareyCreed.com. The CD is fantastic! Lynn also added some harmonies to Songwriter, Mike Kelly's new CD project! WGDR, 91.1FM, VT, Acoustic Harmony, 8/6/11.